Carrer de Blai, known as the tapas street of Barcelona, is literally a street where you will find tapa bar after tapa bar. Most tapa places in Barcelona will overcharge you and you will end up paying a minimum of 2€ per tapa. Still cheap? Blai beats that and offers you pinchos or pintxos (as they are originally called) for only 1euro! By the way, the literal meaning of pincho is “spike” in Spanish, and it refers to the sticks the tapas have on them. The spelling for Pintxo is from the Basque country were these little pieces of art originate from. 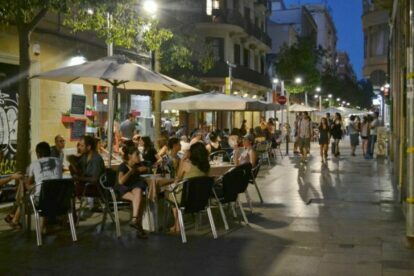 The best way to enjoy this street is, first of all, to come on an empty stomach, and second, treat it as if you are bar hopping (but in this case pincho hopping). As soon as you enter any bar you will see yourself standing in front of a big variety of pinchos (it can almost get a little overwhelming!). Serve yourself: take a plate and fill it up with as many pinchos as you want, then the waiter will ask for your drinks and bring them to your table. Make sure you leave some space for the next bar, as every place has something different to offer, and enjoy the pinchos bar crawl!